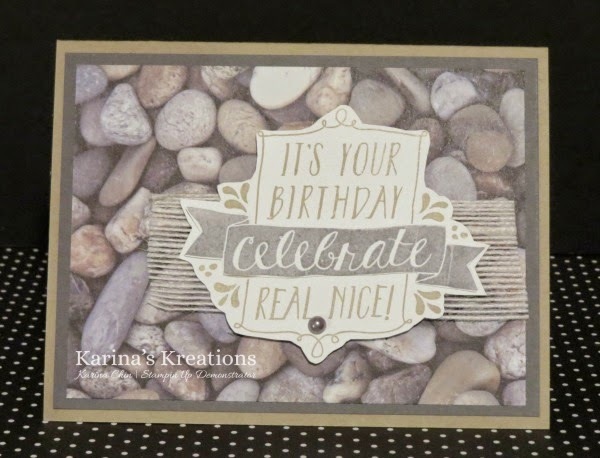 Karina's Kreations: Balloon Bash Masculine Birthday Card! Balloon Bash Masculine Birthday Card! I'm still playing catch up from my Leadership Orlando adventure! I was supposed to be home Sunday afternoon but my plane was cancelled and I was stuck in Las Vegas. I eventually bought a new plane ticket just so I could get home. I made this cute card using the new Adventure Bound Designer Series Paper Stack. The stack is only $8.50 and has beautiful designs. One side is nature type scenes and the other sides are masculine patterns. If you want more details for the card, sign up for my newsletter. I will be sending it out today or tomorrow. There is a shopping list and card instructions in the newsletter.